ANYTHING IS POSSIBLE. The Ironman brand is a statement of excellence, commitment, passion, perseverance and the spirit of never giving up. It is possible to take the same commitment as the Ironman Triathlete to achieve your fitness results! IRONMAN Fitness has taken on the challenge of designing and developing light commercial, high end home exceptional strength and weight training equipment with Lifetime Warranties. At IRONMAN Fitness, ANYTHING IS POSSIBLE! Features: 360 lbs. of real weight plate capacity. 81" in height when attached to IRONMAN Benches and Power Cage. Storage post is 7" in length. 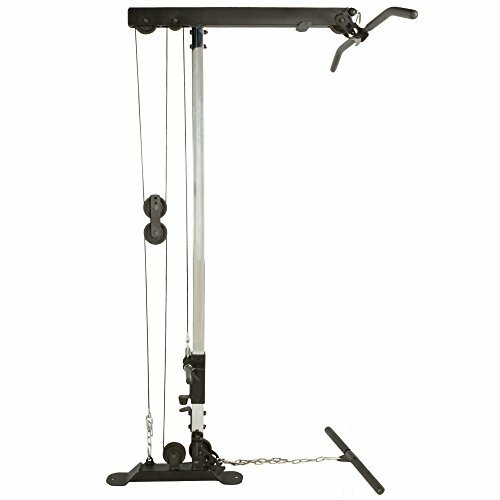 Includes high (lat) and low row pulley systems. High tensile strength nylon coated cable pulleys have been tested up to 2200 lbs. Attachments include lat bar and low row bar with high density foam grips. Easy glide 2" x 2" Chrome plated attachment post. For use with Olympic or standard weight plates. Included is 1 standard weight plate bar and two 1-inch Spring Clip Collars. 2" Olympic plates can be used with Olympic Adapter Sleeves. 2 Olympic Adapter Sleeves included as a free gift. Textured high density foam rubber hand grips. Effective for strengthening the upper back, shoulders and arms (biceps and triceps). Minimal assembly required. Included one 20" straight bar and one 44" lat bar. Designed to be used with IRONMAN Power Cage and Olympic Benches. Weight plates and IRONMAN Power Cage not included.